I must give a shout out to my friend Rikki and her family. 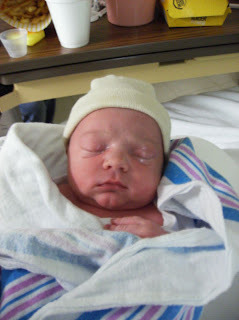 Baby Logan Ray was born at 2:09 pm yesterday, weighing in at 8 lbs, 13 ozs, he joins his mom and dad and 2 older sisters. I swear pregnancies always seem to go faster when they're someone elses. It seems like just last month she got pregnant. I'm sure she feels differently, but he's here none the less and Mommy and baby are doing great. It will be fun to watch the mother/son bond form. Rikki was fearful that she wouldn't know what to do with a little boy, I think she is going to find herself pleasantly surprised. Little boys are just so fond of their mothers and as far as I've seen, that love never wavers. I was thrilled that my first was a boy (right after I got over the disappointment that it wasn't a girl). The family likes to spend Summer vacations in the Outer Banks, and I can picture it now...the 3 girls on the beach, and Daddy and Logan playing Frisbee or fishing. Mike is lucky to have a son, and even more lucky not to have a third girl. Welcome to the world Logan! What a sweet picture of a sweet baby! Congrats to your friend and her family!